Just when you think “he can’t possibly be saying that, there’s an obvious objection” – he anticipates, and replies … great stuff. From some time in the late 1980s. 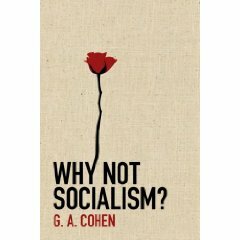 The stupidest decision I made as an undergraduate was not to go to Jerry Cohen’s lectures on Marxism. The London colleges, despite being almost completely separate, pooled resources to give Philosophy lecture courses for 2nd and 3rd years. The lectures were held in tiny lecture rooms at Birkbeck – I seem to remember usually being there on Tuesday and Thursday mornings. 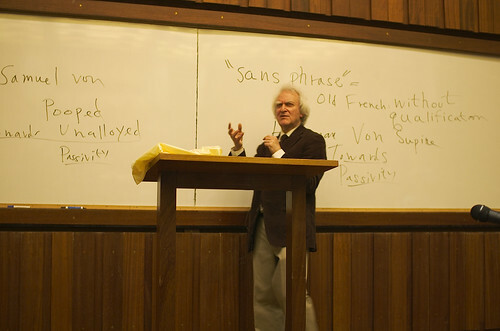 The relevant term, Jerry’s lectures were on the same morning as the philosophy of language and philosophy of mind courses; I knew that I only had the concentration for 2, and, despite being, I presumed, some sort of Marxist (unaffiliated), I had no interest in political philosophy (not least because I believed some quite unsubtle version of Marx’s theory of history). (I’ll also admit that I responded somewhat to peer-pressure; my mate Adrian was not going to the Marxism lectures, and it was fun to have coffee with him instead). Like, as I later found out, Jerry, I had not come to study philosophy in order to learn about political ideas – I’d been politically active since I was 15 and had been exposed to all the political ideas that implied while I was in secondary school (taught History by a member of the CPB (M-L); indirectly recruited to the peace movement by a former CPGBer; worked with someone in the NCP, various SWPers; engaged in conspiratorial faction fights within the peace movement against various Trotskyists including CB’s flatmate of that time… you get the idea). I went to university to study something that I knew I couldn’t learn any other way – analytical philosophy. So it was easy to pass up Jerry’s lectures, even though everyone said they were brilliant, and even though I was interested in Marxism. as a celebration of getting my degree and read it first on a trip after graduating; I studied it about half-way through graduate school (along with these papers by Levine and Wright, and Levine and Sober), and more than anything else was responsible for my shift away from philosophy of language to political philosophy; because, like most readers of KMTH, I became convinced that the version of Marx’s theory of history that had seemed to me to make political philosophy irrelevant was false. I then read what is still my favourite Jerry paper, “The Structure of Proletarian Unfreedom”, and subsequently saw him lecture at UCLA; from then on I guess I read nearly everything he published, as soon as I could get my hands on it. Speaking of G.A. Cohen, “Philosophy Bites” has a brief interview (less than 11 minutes) with him that serves as a nice introduction to his thought. speaking at the All Souls memorial. I got a call this morning to tell me that Jerry (G.A.) Cohen has died suddenly and unexpectedly of a massive stroke. I want to write an appreciation of him as a friend, mentor and philosopher in due course, but I’m too numb to do it at the moment. I know that his other friends, colleagues and fellow students of his feel the same acute sense of loss. Many of his friends. colleagues and former students were present at a wonderful performance from Jerry Cohen (G.A. Cohen) yesterday. 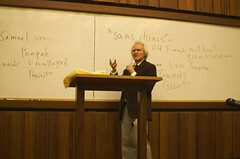 Jerry is retiring as Chichele Professor and gave his valedictory lecture. Here Jerry recreates Isaiah Berlin explaining the influence of the altogether neglected Samuel von Pooped on the totally forgotten Herman von Supine. Thank you to Ingrid for introducing me, and to all current members of the Crooked Timber for welcoming me on board. I am a long term fan of the Crooked Timber (since my days as a graduate student, in fact!) and therefore really excited to be joining the team. I would like to kick off by elaborating on some thoughts that I have only briefly mentioned in a recent piece. The basic idea, in a nutshell, is the following: could it be that we sometimes have reason to be more radical under non-ideal circumstances than under ideal ones? The reason why this might seem initially puzzling – it definitely is to me – lies in the fact that, by definition, non-ideal theory falls short of ideal theory in important ways. Sure, the suggestion is often made that our obligations of justice under non-ideal circumstances might become more demanding – simply because we might be required to compensate for the non-compliance of other duty bearers (although some people want to resist that thought ). This, however, is a point about the demandingness of our duties, not about how radically our aims should diverge from the status quo. When it comes to what we should be aiming at, rather than how much effort we should put into it, non-ideal theory is usually depicted at giving us targets that are closer to home. We should be more modest, we should not demand too much. We cannot have a truly egalitarian society, but we can maybe try and aim for a more humane one than the one we currently have. We cannot have gender equality, but we can maybe narrow the gap. We cannot put an end to capitalism, but maybe we can tame it just a little bit. The most obvious way in which this approach plays out is in the chase of the political centre by the mainstream left, which has been making social-democratic agendas ever more lukewarm over the last three decades. If you haven’t heard, there’s a new edition out [amazon] of our Corey’s The Reactionary Mind. I have duly purchased the updated version. He didn’t just drop Palin and add Trump. It’s better put together, as he says in the Preface. I bought the basic argument first time round. I found some things quite clear and compelling that I know others did not. Perhaps this time the more benighted shall see the light. Here’s hoping this new edition wins over skeptics. It would have been funny if the new subtitle were: ‘I totally told you so and now LOOK!’ But I guess Oxford doesn’t play that way.